You probably know Twenty Questions (in German also known as Wer bin ich? ): A player chooses a celebrity or an object and the other players have to figure out what by asking only yes-or-no questions. I took this game and made a similar one for discussions to be more productive. In many cases, the reason is probably wrong motivation, where people discuss because they want to “win” or “persuade”. Let’s take out these cases here because I can’t help them either. Unfortunately, many discussions also go wrong if the motivations are sound, i.e. where all the participants want to understand each other, and also are willing to accept that they might be wrong themselves. These discussions I will try to fix here. The disagreement is not defined well. In extreme cases, both people actually completely agree, while just being at cross-purposes. This happens mostly when terms are understood differently. Even when the disagreement is understood well, people in a typical I-talk-you-talk debate mostly use their talking time to fill in as many of their favourite arguments as possible for their case, garnished with some well-crafted rhetoric, until the unwritten social rules prescribe their opponent some airtime. 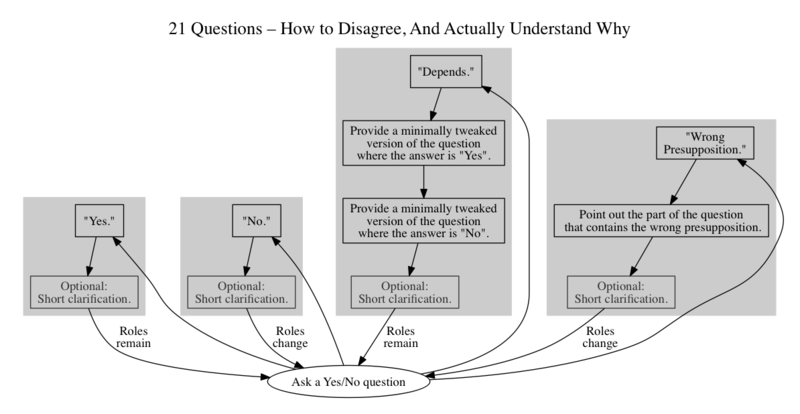 The problem with this framework is that people only bring up the arguments that convinced them, instead of addressing the points that the other person is not yet convinced about. The last point is crucial and to fix this, I believe a discussion must be question-driven. Only this way you can find out what your unbeliever is actually not believing, and why not. If you discussed with someone for half an hour and no questions were asked at all, your time was likely wasted. This is why 21 Questions is all about questions. Unlike the original Twenty Questions, this game is not about hiding “the truth” as long as possible. Instead, we want to achieve mutual understanding on the one hand, and on the other find inconsistencies in our co-player’s reasoning, and – yes, that may sound hard – get our own opinion checked for weak spots, and maybe also change our mind. So actually, there’s no formal winner or rule on how 21 Questions ends. Play it as long as you want. We simply use the framework of 21Q, as it suits our communication goals. are willing in principle to change their minds. Check if all of them apply, otherwise you won’t get the best results. First, the basic outline. See here the flowchart in a bigger resolution. A asks B a Yes/No question. B has 4 options to respond. The answer must be one of these. “Yes”. A continues to ask. “No”. Role change, B starts asking. another version where B answers No. “Wrong presupposition.” Here, B needs to point out to A the words in the question that contain the wrong presupposition. Role change, B starts asking. Shall everyone be allowed to carry a pistol in public? Shall everyone be allowed to carry a machine gun in public? Optional clarification: I am fine with all types of firearms to be carried in public. Shall everyone be allowed to own a nuclear bomb? Shall everyone be allowed to carry a knife? Shall citizens be not allowed to have guns while the police shall be allowed to have tanks? I do not think “the police shall be allowed to have tanks”. Very importantly, the answer must always contain one of the four options. It’s OK to voluntarily give an additional clarification in 2 or 3 phrases – but you must not forget the actual answer. Come by to see an introduction and attend a practical workshops where will play it! See also the Facebook and the Meetup event and tell us if you’re coming. This entry was posted in English on April 13, 2018 by Georg.